I don’t travel very much. It takes away from my precious time sitting at home, drawing pictures of horses playing poker. As a result of my general policy of remaining in or around New Jersey, I presume that the way things are here is the way things are everywhere and I have no evidence to the contrary. Well, we here at BrainLazy have got readers all over the country and all over the globe, so I figured why not put you to work? Here are a few things I suspect might be regionally unique. I am fortunate enough to live in a town where any food of any type you have in mind can be delivered right to your door. In fact, there is a fair amount of redundancy, too. Our resident Greek take-out place went on fire recently, so we are down to our backup. 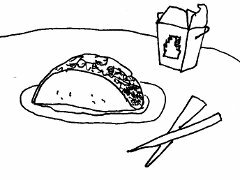 Usually you can expect the ethic food you order to be prepared by the ethnicity it represents, but for some reason around here nearly all of the Mexican Food places are actually combination Chinese Food Mexican Food Restaurants. We have no shortage of authentic Mexican-Americans in town, yet if you get a hankering for a steak enchilada it will be an Asian whipping it up. Does this bizarre cultural switcheroo happen near you? In keeping with the food theme, the following things are on every diner menu in a ten mile radius of my house: Spinach Pie, Gyro, Disco Fries, Taylor Ham, Egg Sandwich. I’ve been told that not only are Spinach Pie and Gyro fairly rare occurrences when you get far enough from New Jersey, but there are huge swaths of the populous who have never even heard of Disco Fries, Taylor Ham, OR egg sandwiches. For you unfortunate souls, let me first educate you. Disco Fries are French Fries with Cheese, either Mozzarella or American, and brown gravy on top of them. Taylor Ham is a brand of pork roll, which seems to be the result of a night of passion between a slab of bacon and some Genoa Salami. It seriously gives bacon a run for its money in the breakfast meat department. An egg sandwich – at least the one I order – is a kaiser roll with Taylor Ham, scrambled egg, cheese, salt, pepper, and ketchup. It is this meal that fuels most of blue collar New Jersey. If you aren’t from Jersey, is there anything on the menu that you can’t do without, but can’t find anywhere else? At first I thought this was a local thing, but the more I talk to my friends, it might just be a figment of my imagination. There was a pizza place in my town called Rocco’s. It doesn’t exist anymore, but when it did they were known for their thin crust bar pies in general, and a concoction called the Garbage Pie in particular. This was a pizza with every available topping except anchovies. It was a monster, and it was delicious. For a while I could call up any pizza place in town and order a garbage pie and get the same thing. Like the Hawaiian or the White Pizza, the Garbage Pie was a nifty shorthand for a specific configuration of toppings. Perhaps it was the demise of Rocco’s, or perhaps it was just a change in trends, but the Garbage Pie has all but vanished. Was this mythic contrivance a strictly Jersey thing? Or did you have something like it where you live? While I’m at it, it has been indicated that those of us in New Jersey are among the only ones who will refer to a pizza as a “pie.” Is this true? Are we the only ones that refer it to this way, IE correctly? That’ll do it for now. Hopefully I can get some insight into the food facts for other states and other lands. We DO have a comment system. It is right down there, under the post. Please feel free to join up and speak your mind. Either that or you could shoot us an email. We’d love to hear from you.